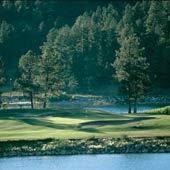 Come and see why the Mescalero Apaches have called this beautiful place the home of the Mountain Gods! 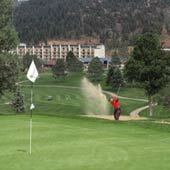 Breath-taking is an often-used work when describing the scenery at this mountainside course. Sierra Blanca, an impressive 12,000 foot mountain peak, provides a spectacular backdrop, and tall pines surround your play. Designed by architect Ted Robinson, the championship course here is both interesting and challenging. At a 7,200-foot elevation and in a heavily forested part of southern New Mexico, this resort golf setting is cool and comfortable! 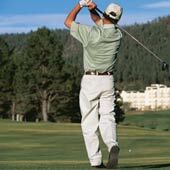 The golf season typically begins in early April and extends through mid-October, depending on the weather. Situated high in the picturesque mountains of Mescalero, New Mexico, just outside of Ruidoso, come and enjoy clean mountain air, breathtaking scenery and exciting entertainment options at the inn of the Mountain Gods, New Mexico’s extraordinary resort and casino. Public Course–18 Holes. Open April 1–November 30, 7 days a week. Tee times are recommended; reservations taken up to 14 days in advance. Facility/Services: Putting Green, Pitching Green, Practice Range, Instruction, Snack Bar, Restaurant, Bar, Pro Shop, Carts, Tournament Services, and Club Rental. Fees: Seasonal (May thru September) Guest Weekday, $80.00, Non-Guest Weekday, $100.00, Guest Weekend, $100.00, Non-Guest Weekend, $135.00. Call for shoulder season rates (April, October, November) and Holiday Weekend Rates. Getting There: Located on the Mescalero Apache Reservation. From Highway 70, turn onto Route 4, go about 3 miles to the Inn of the Mountain Gods.